Israeli Ambassador to the United Nations, popular Likud politician Danny Danon, is expected to resign from his post in order to run for the Likud Party primaries. Danny Danon, Israeli Ambassador to the United Nations, addresses the U.N. Security Council meeting on the situation in the Middle East. Credit: U.N. Photo/Loey Felipe. Though the U.N. Security Council passed the anti-Judea and Samaria Resolution 2334 during his tenure, Danon worked amicably with U.S. Ambassador to the United Nations Nikki Haley to include condemnations of Palestinian violence in their anti-Israel resolutions, and during his tenure, the U.S. administration officially recognized Jerusalem as the capital of Israel. Danon also succeeded in getting the United Nations to recognize Yom Kippur as an official holiday, took part in amending the U.N. General Assembly resolution Global Counter-Terrorism Strategy to include a condemnation of the use of civilians as human shields by terror organizations, and succeeded in getting the U.N. Security Council to condemn a terror attack on Tel Aviv’s Sarona Market. 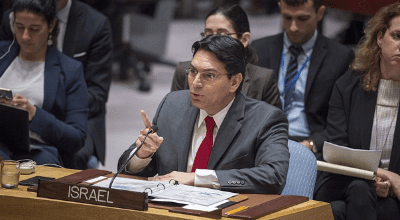 Danon was also the first Israeli envoy to be appointed to head the U.N. Legal Committee and served as vice president of the General Assembly on behalf of Western states. Wow, So what, getting UN to condemn acts of terror, all words no action they continue on no matter how many people say we conden their actions… but look on and do absolutely nothing. What’s the \point.